NOTUS Electronics Ltd. mains affordable for all size and type of vessel. end monitoring solutions. On the other end of the spectrum are some very new remote The ‘SAT’ in ‘EMSAT’ stands for ‘satellite’, and its inclu- sensing technology companies. EMSAT, with a team com- sion in the company name was no chance occurrence. 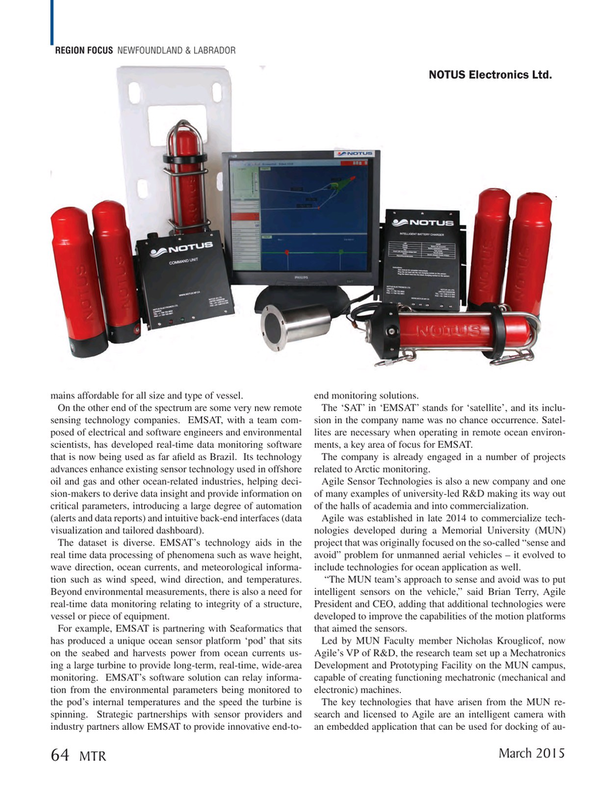 Satel- posed of electrical and software engineers and environmental lites are necessary when operating in remote ocean environ- scientists, has developed real-time data monitoring software ments, a key area of focus for EMSAT. that is now being used as far a? eld as Brazil. Its technology The company is already engaged in a number of projects advances enhance existing sensor technology used in offshore related to Arctic monitoring. The dataset is diverse. EMSAT’s technology aids in the project that was originally focused on the so-called “sense and real time data processing of phenomena such as wave height, avoid” problem for unmanned aerial vehicles – it evolved to wave direction, ocean currents, and meteorological informa- include technologies for ocean application as well. For example, EMSAT is partnering with Seaformatics that that aimed the sensors. has produced a unique ocean sensor platform ‘pod’ that sits Led by MUN Faculty member Nicholas Krouglicof, now on the seabed and harvests power from ocean currents us- Agile’s VP of R&D, the research team set up a Mechatronics ing a large turbine to provide long-term, real-time, wide-area Development and Prototyping Facility on the MUN campus, monitoring. EMSAT’s software solution can relay informa- capable of creating functioning mechatronic (mechanical and tion from the environmental parameters being monitored to electronic) machines.